A BIG week for fans of the original open source OS, Linux. It's been 20 years since the first Linux kernel was written by Linus Torvalds, but that's just one thing that's helped make this year's Australian open source conference linux.conf.au a bit special. The other is the appearance by a man who it seems cannot be named unless it comes with the prefix "founding father of the internet". 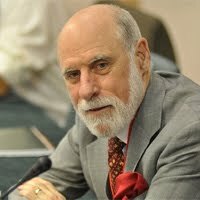 Yes, Google's chief evangelist Vint Cerf, who among other things, gave us email and TCP/IP technology, will be appearing at lca2011, starting with a keynote address today. And the White Label Space Link? Cerf's here because Lunar Numbat team leader Marco Ostini - wearing one of his many other hats as lca2011's speakers and media manager, invited him. "Google is a very Open Source friendly company and one of the Brisbane paper's committee members worked at their Mountain View office, so we just asked him nicely," Marco said. "And Vint said yes, nicely." "Without the protocols that Vint and his colleagues developed, there may still be no internet. "Many a good thing has been born of the internet, including Linux. Having Vint Cerf at lca2011 gives us a tangible way to express our admiration, and also to learn from him. "He brings wisdom, experience and the integrity of his consistently good example." Lunar Numbat itself was born at lca2009 and this year will have its own place, running the Arduino miniconf and helping out with the rocketry miniconf. Attendees will get the chance send their own rockets to 5000ft and receive telemetry via Lunar Numbat team member Luke Weston's recently released MobSenDat datalogger kit. Luke's giving a Lunar Numbat presentation as well, while Jon Oxer's up for an open hardware related presentation. Marco said Cerf's presence provides plenty of opportunities for Lunar Numbat at lca2011. "He's worked a little on the problems of interplanetary TCP/IP (the protocol the Internet runs on) and there are some sober and serious considerations that come from that," he said. "In no small measure Vint will inspire Lunar Numbat people to do what we do simply and well, to plan ahead and to build on it."